Rediff.com » News » Will 'Mersal' row catapult Vijay into politics? Will 'Mersal' row catapult Vijay into politics? The question is not if Tamil actor Vijay would enter politics. Instead, it is about his chances of success, if any, says N Sathiya Moorthy. Even without the recent controversy, Tamil cinema’s ‘Ilaya Thalapathi’ (‘younger general’, superstar Rajinikanth being the real one, named after Mani Ratnam’s Thalapathi, or ‘general’, starring him) was being rumoured to be planning a reluctant political entry for long. But after Tamil Nadu BJP leaders’ not-so-uncharacteristic jibes at him, he could not hope for a better political entry than now. For starters, the Vijay starrer Mersal, already troubled by court cases over its authorship, title-claims and PETA posturing on animal rights, might at best have had a good Diwali weekend collection on release, but the political controversy has made it a must-watch, overnight. Truth be told, this is not the first time that such objections are being raised against a Tamil film, but then the circumstances and personalities are entirely different. Earlier, Vijay-starrers like Thalaivaa, and also Kamal Haasan’s Virumandi and Vishwaroopam, among others, had faced similar political pressure, particularly from then AIADMK Chief Minister Jayalalithaa, mostly citing other interest-based caste or religious groups for so-called intervention by the state government. As Congress vice president Rahul Gandhi pointed out in his tweet supporting Mersal, Tamil Nadu has had a long history of film-politics interoperability. Party veteran P Chidambaram tweeted to ask what would have been the fate of Parasakthi, the path-breaking Tamil movie of the early ’50s penned by DMK chief M Karunanidhi, if released now and starring ‘Sivaji’ Ganesan. If the Parasakthi genre of Tamil films had a strong dose of pro-poor, anti-status quo story-line, dialogues and lyrics, all equally powerful, from the era of Rajnikanth’s ‘anti-hero’ days of the ’80s onwards, high-cost commercial cinema has been relying on ‘punch-lines’ and powerful dialogues for the protagonist to convey a strong message to the Establishment in one scene even while flying off to European locales in the very next for a dream song. After Rajinikanth, Vijaykanth chose his story-lines and punch-lines with an eye on the new-generation voter, who was presumed to be wanting political change, that too at a time when conventional, non-Dravidian political parties and their leaders did not display any patience or staying power, or both. Even as Vijaykanth began with his DMDK ahead of elections 2006 to the state assembly, the likes of Vijay were also possibly left with little choice but to keep their films tuned to the new generation, even more, if they had to be a hit in the box office. That way, Vijay had called on Rahul Gandhi in his time, on Modi when the latter became a national star, and on Karunanidhi nearer home. He did try to call on Jayalalithaa, reportedly, at her Kodanad estate but to no avail. Today, the question is if Vijay, whose film-maker father, S A Chandrasekar is said to be nursing political ambitions for his son, would be forced to yield and consider an off-screen role, as well. With Rajini and Kamal already hinting at a post-Jaya political entry after Karunanidhi getting bed-ridden, as if to fill in what possibly is still a non-existing political vacuum of any non-political kind beyond a point, the question is not if Vijay would enter politics. Instead, it is about his chances of success, if any -- which is what would also decide if he would still want to do it, especially after Vijaykanth bombing in politics more than he ever did at the box office. Unlike others, Vijay still has a strong fan following that is untested in politics. But that is not saying a lot in real politics, however. After making a lot of noise and kicking up a lot more of dust, Rajinikanth has been silent about a political entry after social media and even peripheral political forces like Seeman panned him for allegedly exploiting his fans’ need-for-change sentiment to make a commercial success of his movies, and leaving them in the lurch otherwise. Kamal Haasan began well with his tweets, but has been silent over the past couple of weeks, possibly also because of the confusion confounding anyone in his place in the state’s contemporary political setting, which is more layered and nuanced than any of them can understand and risk a straight jump without second thoughts. ‘Second thoughts’ is the operative word as far as the Tamil Nadu voter is concerned, all along. Apart from feeling ‘used’ at times by the stars of their choice, the voter is also uncomfortable about ‘doubting Thomases’ entering the political fray (like Rajinikanth) or jumping boat, like Vijaykanth. It is another matter that more than one film of Vijaykanth has made commercialisation of medical care its central theme, and Vijay, too, had not left out the 2-G scam from his movies even when rumours had it that he was joining the DMK or when he had met Rahul Gandhi. But no party felt hurt by those references at the time, unlike now. So what gives? 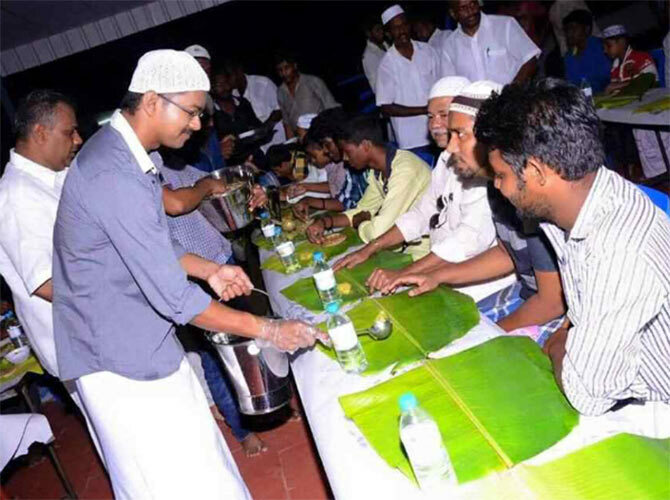 Image: Tamil actor Vijay serving food at an Iftar party organised in July 2015 for his 41st birthday.